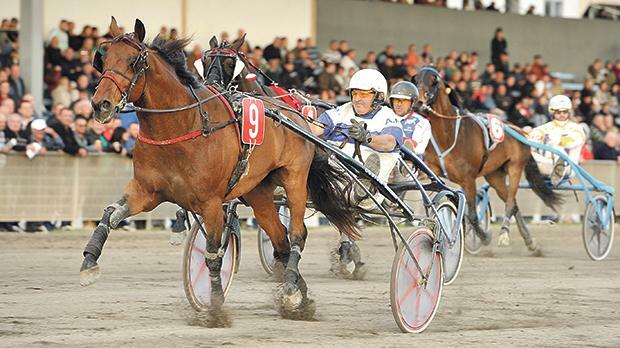 The Marsa Racetrack yesterday hosted the sixth meeting of the season made up of nine races all for trotters. The programme included the two semi-finals from the Assikura Championship for class Gold trotters on a short distance of 2,140m and a normal class Premier race on a mile distance. The latter was won by Un Amour Du Pont, driven by Andrew Farrugia. Thirteen trotters lined up for the class Premier race. It was Uvario (Clint Vassallo) the fastest horse at first, opening a small lead from Venicio Bello (Andrew Pace) and Sam Forget (Nathaniel Barbara). But Uvario started to slow down when the pacesetters turned for the final straight. This French trotter was overtaken by Un Amour Du Pont (Andrew Farrugia) which registered its first win of the season from Danish newcomer Tip Chip (Noel Baldacchino) while Uvario had to settle for third place. Another newcomer, French Un Beau Luxor (Paul Galea) placed in fourth place. From the two class Gold semi-finals, 12 horses made it to the final stage. In the first race, Kurt Saliba put Uncle Oaks in front around 400m from the finishing line. This French trotter sealed its first win of the year from Ruy Blas d’Ariane (George Attard), Tipol De Nappes (Michael Ghigo) and Quite A Feeling (Dolan Casha). Kaching (Paul Galea) and Ripsos De Fa (Ivan Bilocca) also made it to the final stage. There was a keen duel between Swedish Sandsjons Revenue (Charles Camilleri) and French Axel Tilly (Julian Farrugia) in the final straight of the second class Gold race. It was the former which took its second consecutive win with Royal In (Marco Debono), Angelus Du Pont (Redent Magro), Black Gold (Herman McKay) and Vivaldi De La Dive (Sam Cassar) also obtaining a good placing. Yesterday’s card included also two normal class Gold races on a mile distance. In the first race, Tyrol De Feugeres (James Falzon) obtained its first win of the year after sprinting well in the final straight. Similar was the second race from the same category. Uciano (Charles Camilleri) managed to beat Uniaxe Erem (Frankie Abdilla) in the final metres.